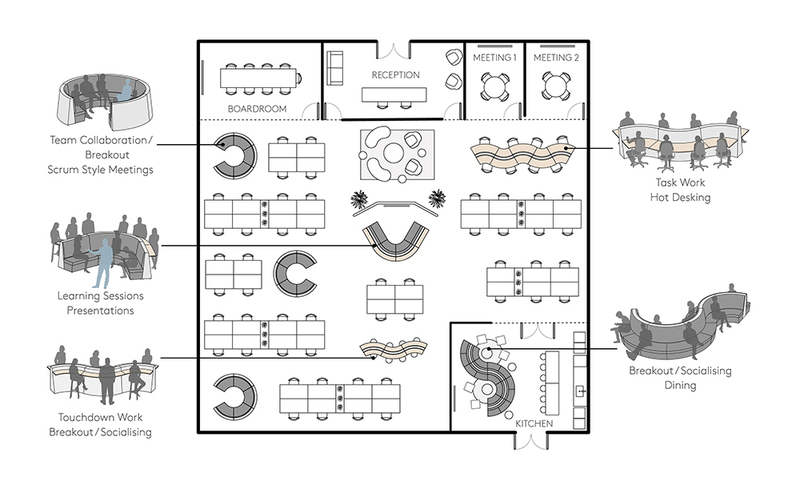 Are those large meeting rooms wasting precious office space? Studies by Microsoft recently revealed that 50% of their enclosed meeting rooms were generally only occupied by one person – even large rooms. At Microsoft they’re currently focused on creating spaces that work for how people actually use them – with the aim of designing for the best user experience. The company is currently undertaking an overhaul of its 800 offices around the world. In the Milan office they completed a time-use study to see how employees were using the space (Designing for the employee experience-Doug Lowrie, Global Workplace Product Manager, Microsoft, The Leader, March 2018). Using data points collected over 180 days through Wi-Fi they were able to track how people were using the spaces. They were surprised to learn that 50% of enclosed meeting spaces were generally occupied by only one person – even large rooms. This helped them determine the need for fewer larger conference rooms, thus cutting down the amount of expensive real estate required. They were also pleased to observe that almost at once the vibe changed and the entire office became more energised and “less like a ghost town.” Microsoft believes that getting this right helps to create the “right balance of human energy” in a space. To solve the problem, more small focus rooms and small enclosed spaces resembling phone booths were made available for team members to use individually for focused task work, or for virtual or face to face collaboration in pairs. To encourage collaboration without enclosed walls, larger spaces were made available in the Milan office that allowed formal collaboration in a more open environment. It was acknowledged that it was important to get the design of these spaces right as “The location can’t be too public, or it won’t get used.” Successful designs needed to offer a measure of both visual and auditory privacy. Workplace planning firm DEGW set up areas in the Microsoft office known as ‘Creative Gardens’. These are private areas with high-performance acoustics designed for teamwork and brainstorming and are framed with lightweight wooden structures and embellished with plants and greenery. Microsoft’s Redmond, Washington, headquarters is full of semi-enclosed but never quite separated settings that are flexible enough to host a formal presentation or a small, more casual conversation. Acoustic fabrics and overhead baffles provide the acoustic privacy needed. Some are embedded with high-tech features – interactive screens, audiovisual recording devices, transcription software – to enable seamless connectivity away from the desk. At Microsoft’s Paddington office in London open plan meeting areas are semi-private and include connectivity and power points so that employees have access to technology such as touch screens and virtual reality wherever they are. The extinction of the Conference Room? These examples of furniture as architecture, as opposed to spaces being defined purely by walls, are increasingly common in many organisations. Conference room spaces are disappearing and being replaced by formal collaboration settings in an open plan environment. These are even being used for client meetings, where it is seen as beneficial for visiting customers to experience the buzz of their host’s culture. Of course there is still a need for some large scale enclosed spaces – but this is less and less the norm – and organisations like Microsoft are reaping both financial and cultural benefits from the change. Ultimately, forward thinking companies such as Microsoft aim to have buildings adapt to the needs and preferences of the employees who work in them. The hope is that an increase in employee engagement will translate to a corresponding increase in the engagement and satisfaction of their clients. Contact our team to learn more about settings for collaboration in an open plan environment.